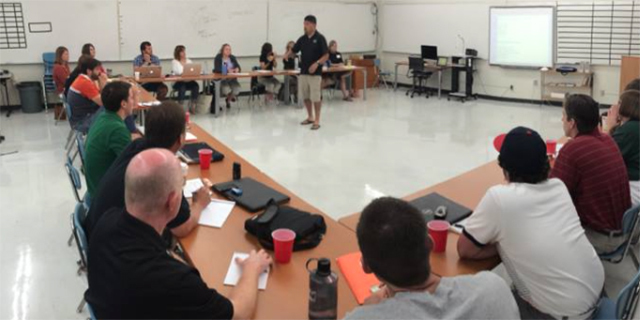 This is the third of a multipart series on podcasting for print and online newspaper staffs. 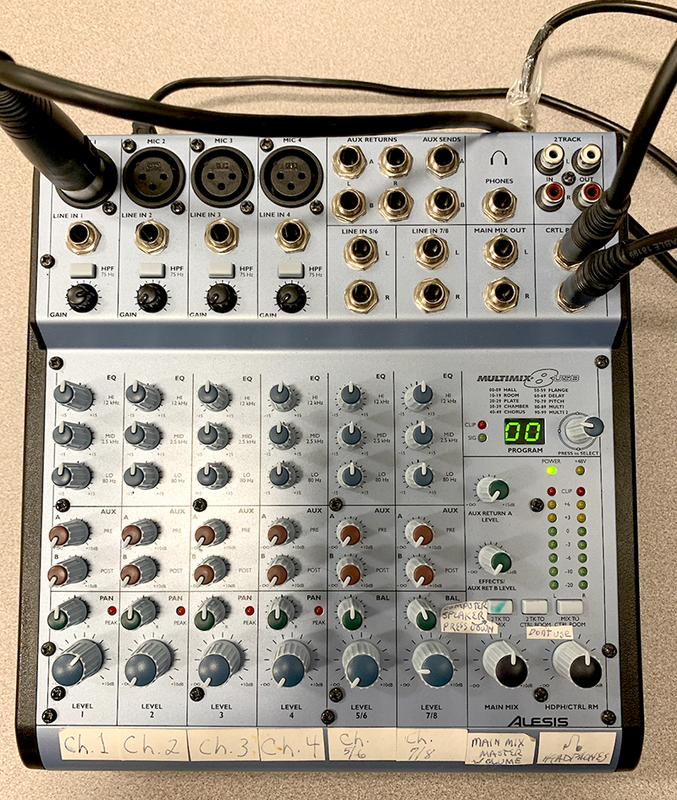 In the simplest of terms, the mixer combines the various audio inputs into one signal that is sent to our workstation for editing on our software. For the majority of our podcasts, that means combining two or more microphone inputs into one signal, which is eventually edited and turned into an audio production. For other audio programming, such as interviews outside of class, the input is one or more audio files from an audio recorder or smart phone. Since we’re recording conversation, we don’t need the sophisticated touch of a professional sound person, just some quick adjustments which will balance the input, or audio level, of each microphone. 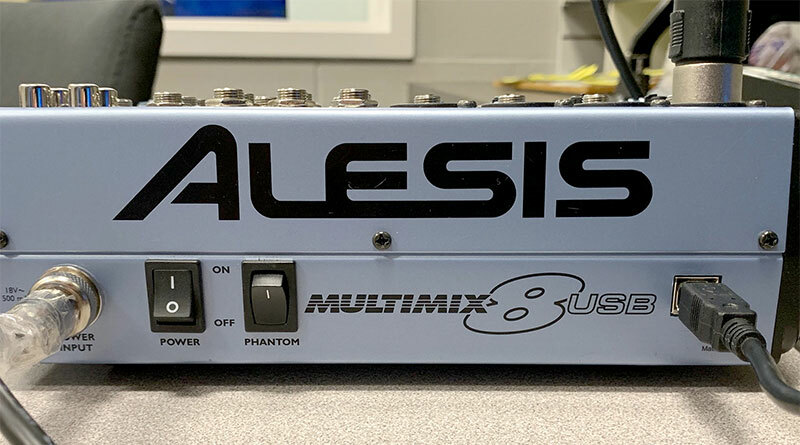 Here’s a quick explanation of how we keep things simple with our Alesis 8-channel mixer, our Shure PG-48 microphones and Adobe Audition CC on our workstation, developed with the help of one of the school’s music instructors who also works with audio on a professional level. The “Gain” control knob is set at the 3 o’clock position. Gain deals with input level coming into a channel, and since the Shure PG-48s are low-output mics our music instructor felt it best to start with the gain at a strong position. Using the channel’s “Level” knob (which can be a slider on some mixers), and keeping an eye on the audio level indicator on Audition, have the person speak into the mic at the same volume he or she will use for recording while adjusting the level. Level reflects volume being recorded. NOTE: Maximum audio level should reflect the level indicator reaching yellow, but not red. Red reflects an audio level that is set too high (too “hot”), and that is when “clipping” occurs. Clipping distorts the audio being recorded. Follow the same steps on Channels 2, 3, and 4, as needed. Sometimes, students have very soft or loud voices, and we’ll adjust the gain or even Main Mix knobs to equalize microphone outputs (that is, speakers’ volumes). We keep things simple as possible as the majority of journalism students/newspaper staff members do not produce more than three or four audio recordings during their 3- to 4-years in the journalism program. Requiring sophisticated usage of the mixer would entail a steep learning curve which is outside of my journalism program’s goals. Referring to the photo above, here’s a quick overview of the controls and our settings on Channels 1-4, from top to bottom. High Pass Filter. Push in to use. We generally use it to minimize air conditioning noise and whatever vehicle traffic/classroom noise gets into the room we use as our studio. Unfortunately, the room is not sound proof. Gain knob: We set it at 3 o’clock. See above for further details. EQ (equalizer) controls: We leave them at 12 o’clock. Auxiliary pre and post: We leave them off. Pan control: Adjusts audio to left or right channels. We leave it at 12 o’clock. Peak indicator light (next to pan knob): Flashes when output level is about to be clipped. See above for further details. Level knob: Controls mic output (volume) on that channel. It is eventually mixed with other outputs to form one output which is then fed into our audio editing program. Microphone is plugged into Channel 1 in this example. Two thin wires on top of mixer: left is USB cable connecting the mixer board to the work station; right wire is power cord. Two TRS inputs, plugged into Control Room jacks, connect the mixer to the headphone amplifier. This allows all participants to hear each other through headphones. (See previous installment for more details on the headphone amp. Two rows of LED lights at far right of mixer: These indicate output levels, which correspond to the levels indicator on Audition. Note the progression of green lights at bottom that change to yellow, then to red, which shows clipping, or distortion, of audio output. You will also see the power on/off and 48-volt phantom power indicators. We do not use the latter as we don’t use condenser microphones. Switches are on the back of the mixer. Next up: Recording podcasts on a smart phone, then simple editing for all audio files.